Selim I (Ottoman Turkish: سليم اول, Turkish: Birinci Selim; 1470/1 – September 1520), known as Selim the Grim or Selim the Resolute (Turkish: Yavuz Sultan Selim), was the Sultan of the Ottoman Empire from 1512 to 1520. His reign is notable for the enormous expansion of the Empire, particularly his conquest between 1516 and 1517 of the entire Mamluk Sultanate of Egypt, which included all of the Levant, Hejaz, Tihamah, and Egypt itself. On the eve of his death in 1520, the Ottoman Empire spanned about 576,900 sq mi (1,494,000 km2), having grown by seventy percent during Selim's reign. Selim's conquest of the Middle Eastern heartlands of the Muslim world, and particularly his assumption of the role of guardian of the pilgrimage routes to Mecca and Medina, established the Ottoman Empire as the most prestigious of all Sunni Muslim states. His conquests dramatically shifted the empire's geographical and cultural center of gravity away from the Balkans and toward the Middle East. By the eighteenth century, Selim's conquest of the Mamluk Sultanate had come to be romanticized as the moment when the Ottomans seized leadership over the rest of the Muslim world, and consequently Selim is popularly remembered as the first legitimate Ottoman Caliph, although stories of an official transfer of the caliphal office from the Abbasid Dynasty to the Ottomans were a later invention. Born in Amasya around 1470, Selim was the youngest son of Bayezid II (1481–1512). Selim's mother was Gülbahar Hatun, a Turkish princess from the Dulkadir State centered around Elbistan in Maraş; her father was Alaüddevle Bozkurt Bey, the eleventh ruler of the Dulkadirs. Some academics state that Selim's mother was a lady named Gülbahar Hatun, while chronological analysis suggests that his biological mother's name could also be Ayşe Hatun. By 1512, Şehzade Ahmet was the favorite candidate to succeed his father. Bayezid, who was reluctant to continue his rule over the empire, announced Ahmet as heir apparent to the throne. Angered with this announcement, Selim rebelled, and while he lost the first battle against his father's forces, Selim ultimately dethroned his father. Selim ordered the purge of Bayezid to a far away "sanjak", Dimetoka. Bayezid died immediately thereafter. Selim put his brothers (Şehzade Ahmet and Şehzade Korkut) and nephews to death upon his accession in order to eliminate potential pretenders to the throne. His nephew Şehzade Murad, son of the legal heir to the throne Şehzade Ahmet, fled to the neighboring Safavid Empire after the support meant for him failed to materialize. This fratricidal policy was motivated by bouts of civil strife that had been sparked by the antagonism between Selim's father and his uncle, Cem Sultan, and between Selim himself and his brother Ahmet. Selim I was described as tall, with very broad shoulders and a long mustache. He was skilled in politics and was said to be fond of fighting. One of Selim's first challenges as Sultan was the growing tension between himself and Shah Ismail, who had recently brought the Safavids to power and had switched the state religion from Sunni Islam to the adherence of the Twelver branch of Shia Islam. By 1510, he had conquered the whole of Iran and Azerbaijan, southern Dagestan (with its important city of Derbent), Mesopotamia, Armenia, Khorasan, Eastern Anatolia, and had made the Georgian kingdoms of Kartli and Kakheti his vassals. He was a great threat to his Sunni Muslim neighbors to the west. In 1511, Ismail had supported a pro Shia/Safavid uprising in Anatolia, the Şahkulu Rebellion. In 1514, Selim I attacked Ismail's kingdom to stop the spread of Shiism into Ottoman dominions. Selim and Ismā'il had been exchanging a series of belligerent letters prior to the attack. Selim I defeated Ismā'il at the Battle of Chaldiran in 1514. Ismā'il's army was more mobile and their soldiers were better prepared, but the Ottomans prevailed due in large part to their efficient modern army, possession of artillery, black powder and muskets. Ismā'il was wounded and almost captured in battle, and Selim I entered the Iranian capital of Tabriz in triumph on September 5, but did not linger. The Battle of Chaldiran was of historical significance, as the reluctance of Shah Ismail to accept the advantages of modern firearms and the importance of artillery was decisive. After the battle, Selim, referring to Ismail, stated that his adversary was: "Always drunk to the point of losing his mind and totally neglectful of the affairs of the state". Outline of the Ottoman Empire, from the Theatro d'el Orbe de la Tierra de Abraham Ortelius, Anvers, 1602, updated from the 1570 edition. Selim then conquered the Mamluk Sultanate of Egypt, defeating the Mamluk Egyptians first at the Battle of Marj Dabiq, and then at the Battle of Ridanieh. This led to the Ottoman annexation of the entire sultanate, from Syria and Palestine in Sham, to Hejaz and Tihamah in the Arabian Peninsula, and ultimately Egypt itself. 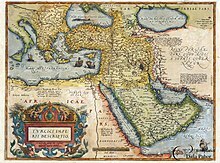 This permitted him to extend Ottoman power to the Muslim holy cities of Mecca and Medina, hitherto under Egyptian rule. Rather than style himself the Ḥākimü'l-Ḥaremeyn, or The Ruler of The Two Holy Cities, he accepted the more pious title Ḫādimü'l-Ḥaremeyn, or The Servant of The Two Holy Cities. The last Abbasid caliph, al-Mutawakkil III, was residing in Cairo as a Mamluk puppet at the time of the Ottoman conquest. He was subsequently sent into exile in Istanbul. In the eighteenth century a story emerged claiming that he had officially transferred his title to the Caliphate to Selim at the time of the conquest. In fact, Selim did not make any claim to exercise the sacred authority of the office of caliph, and the notion of an official transfer was a later invention. After conquering Damascus in 1516, Selim ordered the restoration of the tomb of Ibn Arabi (d. 1240), a famous Sufi master who was highly revered among Ottoman Sufis. 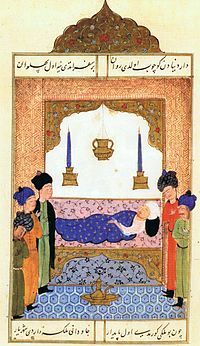 Selim I on his deathbed. This campaign was cut short when Selim was overwhelmed by sickness and subsequently died in the ninth year of his reign. He was about fifty years of age. Officially it is said that Selim succumbed to sirpence, a skin infection that he had developed during his long campaigns on horseback. (Sirpence was an anthrax infection sometimes seen among leatherworkers and others who worked with livestock.) Some historians, however, suggest that he died of cancer or that he was poisoned by his physician. Other historians have noted that Selim's death coincided with a period of plague in the empire, and have added that several sources imply that Selim himself suffered from the disease. On the 22nd of September 1520, Sultan Selim I's eight year reign came to an end. Selim passed away and was brought to Istanbul so he could be buried in Yavuz Selim Mosque which was commissioned by Suleiman the Magnificent in loving memory of his father. Sultan Selim I who died at the age of 50 conquered and unified the Islamic holy lands. Protecting the lands in Europe, he gave priority to the East as he believed the real danger came from there. By most accounts, Selim had a fiery temper and had very high expectations of those below him. Several of his viziers were executed for various reasons. A famous anecdote relates how another vizier playfully asked the Sultan for some preliminary notice of his doom so that he might have time to put his affairs in order. The Sultan laughed and replied that indeed he had been thinking of having the vizier killed, but had no one fit to take his place, otherwise he would gladly oblige. A popular Ottoman curse was, "May you be a vizier of Selim's," as a reference to the number of viziers he had executed. Selim was one of the Empire's most successful and respected rulers, being energetic and hardworking. During his short eight years of ruling, he accomplished momentous success. Despite the length of his reign, many historians agree that Selim prepared the Ottoman Empire to reach its zenith under the reign of his son and successor, Suleiman the Magnificent. "A carpet is large enough to accommodate two sufis, but the world is not large enough for two kings"
They, who by perjuries seize scepters ought not to skulk from danger, but their breast ought, like the shield, to be held out to encounter peril; they ought, like the helm, to affront the foeman's blow. Ismail responded to Selim's third message, quoted above, by having an envoy deliver a letter accompanied by a box of opium. The Shah's letter insultingly implied that Selim's prose was the work of an unqualified writer on drugs. Selim was enraged by the Shah's denigration of his literary talent and ordered the Persian envoy to be torn to pieces. Outside of their military conflicts, Selim I and Shah Ismail clashed on the economic front as well. Opposed to Shah Ismail's adherence to the Shia sect of Islam (contrasting his Sunni beliefs), Selim I and his father before him "did not really accept his basic political and religious legitimacy," beginning the portrayal of the Safavids in Ottoman chronicles as kuffar. After the Battle of Chaldiran, Selim I's minimal tolerance for Shah Ismail disintegrated, and he began a short era of closed borders with the Safavid Empire. Selim I wanted to use the Ottoman Empire's central location to completely cut the ties between Shah Ismail's Safavid Empire and the rest of the world. Even though the raw materials for important Ottoman silk production at that time came from Persia rather than developed within the Ottoman Empire itself, he imposed a strict embargo on Iranian silk in an attempt to collapse their economy. For a short amount of time, the silk resources were imported via the Mamluk territory of Aleppo, but by 1517, Selim I had conquered the Mamluk state and the trade fully came to a standstill. So strict was this embargo that, "merchants who had been incautious enough not to immediately leave Ottoman territory when war was declared had their goods taken away and were imprisoned," and to emphasize frontier security, sancaks along the border between the two empires were given exclusively to Sunnis and those who did not have any relationship with the Safavid-sympathizing Kızılbaş. Iranian merchants were barred from entering the borders of the Ottoman Empire under Selim I. Shah Ismail received revenue via customs duties, therefore after the war to demonstrate his commitment to their thorny rivalry, Selim I halted trade with the Safavids—even at the expense of his empire's own silk industry and citizens. This embargo and closed borders policy was reversed quickly by his son Suleyman I after Selim I's death in 1520. Relations with Babur (first Mughal Emperor in Northern India) were initially troubled because Selim provided Babur's arch-rival Ubaydullah Khan with powerful matchlocks and cannons to counter the influence of the Safavids. In 1517, when ordered to accept Selim as his Caliph and suzerain, Babur refused. In 1519, Selim reconciled with Babur, dispatched Ustad Ali Quli the artilleryman, Mustafa Rumi the matchlock marksman, and many other Ottoman Turks to assist Babur in his conquests. Thenceforth this particular assistance proved to be the basis of future Mughal-Ottoman relations. The German battlecruiser SMS Goeben was renamed Yavuz Sultan Selim after being handed over to the Turkish Navy in 1914. A third bridge over the Bosphorus in Istanbul is called the Yavuz Sultan Selim Bridge. Selim I appears as an important character in the action-adventure video game Assassin's Creed: Revelations. Selim I is the love interest in the romance novel, The Kadin, written by Bertrice Small. ^ a b c Ágoston, Gábor (2009). "Selim I". In Ágoston, Gábor; Bruce Masters. Encyclopedia of the Ottoman Empire. pp. 511–3. ^ a b Finkel, Caroline (2005). Osman's Dream: The Story of the Ottoman Empire, 1300-1923. New York: Basic Books. pp. 110–1. ISBN 978-0-465-02396-7. ^ Savory 2007, p. 40. ^ "Sultan Selim the Excellent". Ottomanonline.net. Retrieved 2012-03-20. ^ "Morgan, David. Shah Isma'il and the Establishment of Shi'ism". Coursesa.matrix.msu.edu. Retrieved 2012-03-20. ^ Burak, Guy (2015). The Second Formation of Islamic Law: The Ḥanafī School in the Early Modern Ottoman Empire. Cambridge: Cambridge University Press. p. 2. ISBN 978-1-107-09027-9. ^ Byfeld, Ted, ed. (2010). A Century of Giants. A.D. 1500 to 1600: in an age of spiritual genius, western Christendom shatters. The Society to Explore and Record Christian History. p. 9. ISBN 978-0-9689873-9-1. ^ Varlık, Nükhet (2015). Plague and Empire in the Early Modern Mediterranean World: The Ottoman Experience, 1347-1600. New York: Cambridge University Press. pp. 164–165. ISBN 9781107013384. ^ Gündoğdu, Raşit (2017). Sultans of the Ottoman Empire. Istanbul: Rumuz Publishing. pp. 262–263. ISBN 9786055112158. ^ Floor, Herzig, Floor, Willem M, Herzig, Edmund, and Iran Heritage Foundation. Iran and the World in the Safavid Age. International Library of Iranian Studies ; 2. London ; New York: I.B. Tauris, 2012. Chapter 5: The Evolution of Ottoman-Iranian Diplomacy through the Safavid Era. Page 81. ^ Floor, Herzig, Floor, Willem M, Herzig, Edmund, and Iran Heritage Foundation. Iran and the World in the Safavid Age. International Library of Iranian Studies ; 2. London ; New York: I.B. Tauris, 2012. Chapter 5: The Evolution of Ottoman-Iranian Diplomacy through the Safavid Era. Page 82. ^ a b Küçükdağ, Yusuf. "Measures Taken by the Ottoman State against Shah İsmail's Attempts to Convert Anatolia to Shia." University of Gaziantep Journal of Social Sciences7, no. 1 (2008). Page 12. ^ Floor, Herzig, Floor, Willem M, Herzig, Edmund, and Iran Heritage Foundation. Iran and the World in the Safavid Age. International Library of Iranian Studies ; 2. London ; New York: I.B. Tauris, 2012. Chapter 13: Trade between the Ottomans and Safavids: The Acem Tϋccari and others. Page 237. ^ a b c d Floor, Herzig, Floor, Willem M, Herzig, Edmund, and Iran Heritage Foundation. Iran and the World in the Safavid Age. International Library of Iranian Studies ; 2. London ; New York: I.B. Tauris, 2012. Chapter 13: Trade between the Ottomans and Safavids: The Acem Tϋccari and others. Page 238. ^ Küçükdağ, Yusuf. "Measures Taken by the Ottoman State against Shah İsmail's Attempts to Convert Anatolia to Shia." University of Gaziantep Journal of Social Sciences7, no. 1 (2008). Page 11. ^ a b Şen, Zafer. Yavuz Sultan Selim'in Trabzon'da Medfun Bilinmeyen Kızı Kamer Sultan ve oğlu Şehzade Salih. ^ a b c Turan, Ebru (2009). The marriage of Ibrahim Pasha (ca. 1495-1536) - The rise of Sultan Süleyman's favourite to the grand vizierate and the politics of the elites in the early sixteenth-century Ottoman Empire. pp. 14, 25. ^ a b c Gök, İlhan (2014). II. Bâyezîd Dönemi İn‘âmât Defteri ve Ceyb-i Hümayun Masraf Defteri (Thesis). pp. 1464, 1465, 1469. ^ Haskan, Mehmet Nermi (2008). Eyüp Sultan Tarihi, Volume 2. Eyüp Belediyesi Kültür Yayınları. p. 535. ISBN 978-9-756-08704-6. ^ Esin, Emel (1977). Merkez Efendi ile Şah Sultan Hakkında Bir Haşiye, Volume 19. Istanbul University. p. 73. This article incorporates text from a publication now in the public domain: Chisholm, Hugh, ed. (1911). "Selim" . Encyclopædia Britannica. 24 (11th ed.). Cambridge University Press. pp. 606–607.